I have been using a Taymor Jumbo Bathtub Caddy for a few years now. I started with an Ultimate Caddy, and while it fit our large whirlpool bathtub, it was really stretched to do so. When I changed to the Jumbo Caddy I really missed all the features from the Ultimate Caddy, mostly the Mirror! The Mirror was the one thing I had not been that impressed with... that is until I used it and found how nice it was to take your make-up off and put your face creams on while soaking in the tub! I went on a mission to try different items on my Jumbo Caddy to try and compensate. At first, I put a small placemat on it with a small make-up mirror, a candle and my bath products, but I couldn't see myself very well with the small mirror and the cork-backing on the placemat started to warp and break-down from being wet so much. Not to mention how un-attractive it all looked in our Master Bathroom! I went on to try many other arrangements and combination of items, all not being either as functional or as decorative as I would have liked. I finally decided to look far and wide for a Make-up Mirror, to buy only for use on the Jumbo Caddy. It needed to be very broad based and stable, not too high so I could see myself in it at tub level, and most of all Attractive! I finally ordered a Jerdon Mirror #LT5165C that looked nice, but I was not too sure how it would work. When it arrived it fit perfectly, it was very stable and it was very easy to position it so I could easily see it in the tub... AND it looked GREAT! Shortly after I got the mirror, I was taking some photos for a Fall Store Ad, and I brought a number of different Bath Accessories from the store as props in my photos. 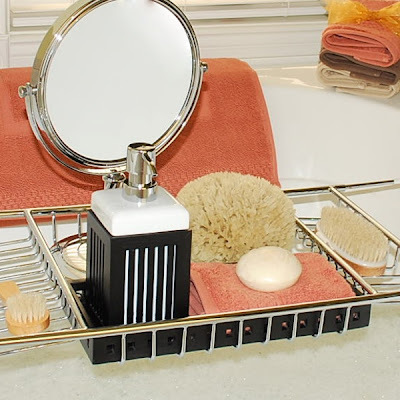 It was that day that I realized that our Kassatex Vanity Trays fit the Jumbo Caddy perfectly! All this time we had them, I had never thought of using one on the Jumbo Caddy. Not only that, but when I put the Mirror, Vanity Tray and a Lotion Dispenser on the Caddy, they all looked SO NICE together! Now why didn't I think of using them all together before? 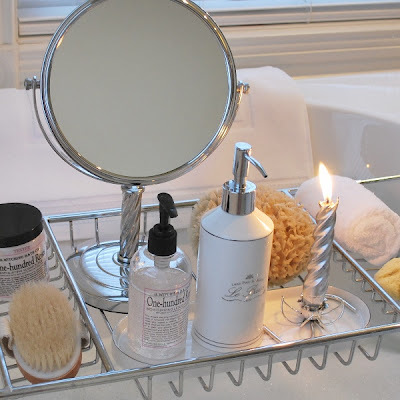 Here is a photo from that day with our NEW Jerdon Vanity Mirror, Tray and Lotion Dispenser from our Phuket Bath Accessory Collection, Cayenne Towels from our Elegance Bath Towel Collection and a few Sea Sponges and Bath Brushes from our store as well. While I like the above set, the colors do not coordinate with my bathroom at all. The photo was for a Thanksgiving Ad, and while the colors look so nice, my bathroom is mostly Blue and Yellow, not even close to matching the above. What I did learn was if this Vanity Tray fit, I was sure that a lot of the others we had would as well. I had the Le Bain set in our Bathroom already so all I had to do it try the Vanity Tray from that, and if that fit, I would have found all the pieces I had been looking for! Sure enough, the LeBain Tray fit, and while I had just put the Lotion Dispenser on just for looks, it did LOOK NICE! What could I use one for so I could put one on my Tray? Shampoo! It was already one of the bottles I kept on my Caddy, and not real attractive at that. If the shampoo would pump out of the Lotion Dispenser, than it would be more than just a decorative piece. I tried the shampoo and it worked well, now my Jumbo Caddy not only was functional - it finally looked as attractive and decorative as I wanted! Above is my final combination of Bath Accessories on my Jumbo Bath Caddy. The Tray and Lotion Dispenser are from our Le Bain Collection, the ones I already had on my counters. I can finally have a candle on my Jumbo Caddy now as well as the mirror for washing my face and any face care I want to do while in the tub. The Bath Brush and Sponges, as well as the One-hundred Roses Liquid Soap and Sugar Scrub are from our store too. The white towels are from our NEW Belaire Collection, one of our softest towels ever and my favorite to date! After two or three years of trying all those different items on my Jumbo Caddy, this combination all came together almost by accident, and I couldn't be happier!